The 44th running of the infamous Baja 1000 will begin in Ensenada, Mexico on Friday, November 18th. DirtFirst Racing’s frontman Andy Lagzdins will once again be a member of the powerful Christy’s/Duncan Racing team on the #6a Honda. The team is in a position to win their first Class 25 Championship to add to their multiple Class 24 Titles, sitting only three points behind the defending champ Wayne Matlock, but only two points ahead of Rafael Torres’ team. The tight points race should make things very interesting at the Baja 1000, as it is the final race in the Championship. At the first Score race of the season, the San Felipe 250, Team Christy’s Honda TRX450R was the first quad to cross the finish line. After penalties and disqualifications were handed out by the Score officials, the team would find themselves bumped to third place due to a missed virtual checkpoint. Sadly, it was a missed opportunity to capitalize on a rare mechanical meltdown by Matlock’s 1a squad, who could only salvage a seventh place finish after multiple suspension issues. At the Baja 500 things were looking good for the team as Lagzdins came over the Summit to find Matlock’s TRX700XX on the side of the track with a broken tie rod end. Lagzdins’ lead didn’t last long however, and while running across the dry lake bed at Laguna Salada the 6a quad came to a halt with a broken timing chain. Head Mechanic for the team, Lenny Duncan, and his son Danny were able to get the quad back together, and with the remarkable performances of the Christy’s team riders they ended the race in third place. The Christy’s Team is led by Craig Christy, who is a veteran of the Score series and in addition to being a fast rider he is also an expert in logistics and race strategy. Dave Scott, a New Mexico native and past Best in the Desert Overall Quad Champion, is the go-to guy for pounding out miles and miles of Trophy Truck whoops. He has a reputation for being tough as nails, and has been known to put 100% into his section of the race to the point where he requires medical attention after he gets off the quad. Felipe “Lipy” Velez Torres, whose team won the Baja 1000 in 2010, has teamed up with Christy’s Racing this year. 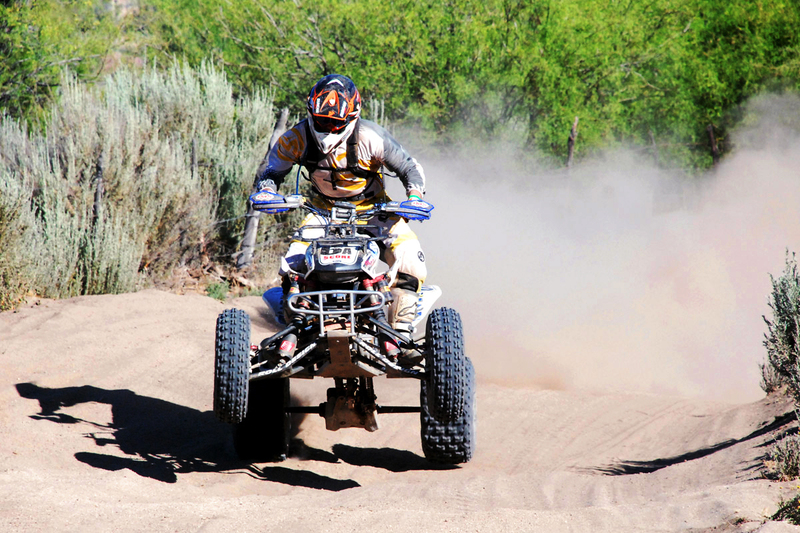 Lipy is a resident of San Felipe, and his combination of blazing speed and familiarity with the terrain and line choices makes him arguably the fastest man around the San Felipe section of the course. Andy Lagzdins comes off a dominant season in National Hare and Hound competition, going undefeated and claiming the National #1 Plate in his first attempt. Andy’s expertise in extreme terrain, which he developed though years of racing on the tight GNCC circuits of the East Coast, gives the team an edge through the most demanding sections of the Baja course. Wildcard rider Garrin Fuller, whose multiple WORCS ProAm wins and Quad-X ProAm Championship this year served notice of his incredible speed on an ATV, is making his Score debut at the 1000. Garrin is learning the ropes and will be ready to take on miles of racing if duty calls. Duncan Racing builds the motors for the Christy’s team, and the reliability of the FatBoy 4 equipped powerplants has helped the team win many championships in the desert. The Elka shocks and Roll Design suspension components the team uses are state of the art, and mandatory if you want to finish and win grueling races such as the Baja 1000. Check out the 6a quad at contingency if you are in Ensenada for the race! Click here to check out the Score International website. You can find out info on the race, start positions, course maps, etc. Click here to find Baja 1000 race coverage in the forums of Race-Dezert.com. Thanks to MyBajaPhoto.com for the above photo from the 500 earlier this year. Check out their site for more great pics.